National Chairman of the All Progressives Congress, APC, Chief John Oyegun on Monday said that Nigerians who are non card carrying members of party were likely to serve as Ministers in the government of President Muhammadu Buhari. 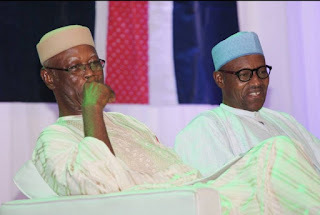 Oyegun also said that he was not interested in the office of the secretary to Government of Federation, SGF as being speculated in different quarters of the country. According to APC National chair, Buhari’s government and APC as a political party were more concerned with assembling technocrats and other competent hands who would key in to the vision and objectives of the present government. Oyegun who spoke to Journalists in Abuja added that the background of such persons does not matter as long as he was capable to deliver and serve the Nigerian people, even as he explained why the list of ministers was yet to be made public. He said: “There is absolutely no dispute between the party and the president. We agreed that we shall use all manner of people: politicians, technocrats, all manner of people even if not politicians, who can deliver and who subscribe passionately to the agenda of the president to move this country forward, irrespective of where the people come from; irrespective of whether the person is a card-carrying members of the party. “What is important is the qualification of the person and the ability of the person to deliver on the ideas of Mr. President. What we are interested is in the ability of the people to bring up the ideas that will help Mr. President achieve the set objectives and the ability to deliver on what the President wants. “Secondly, this is an executive function and the President has the right to consult as widely as possible. This means he might pick people within the party; people outside the party. It is a prerogative the President should exercise and we cannot question that. We are quite happy about the way he is proceeding.